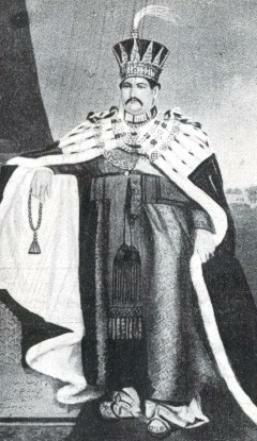 Muhammad ali Shah (ruled 1837-42) wearing the crown of the Nawabs of Awadh as depicted in the teapot. 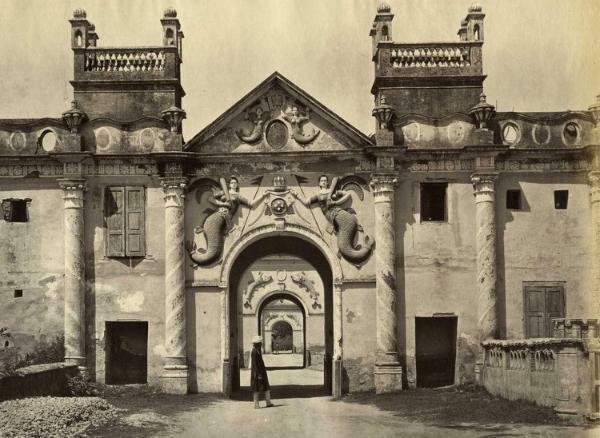 The Jal Pari (the Mermaid Gateway), circa 1865. The gates were demolished around 1870. 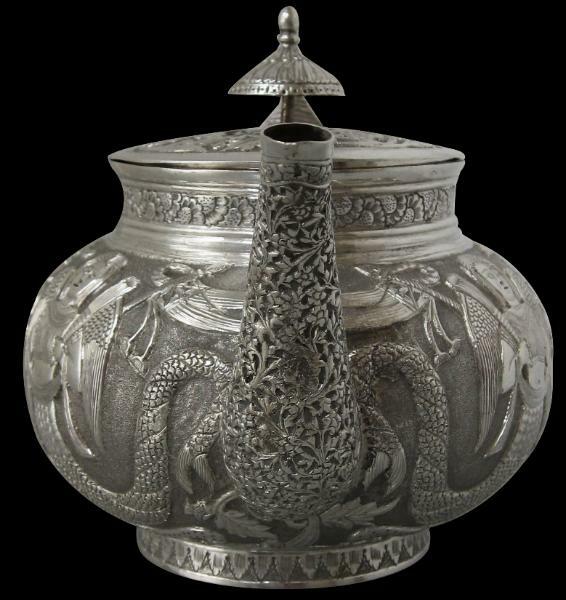 This elegantly proportioned silver tea pot is from Lucknow. The motifs are highly unusual and incorporate the royal emblem of the Nawabs of Oudh (Awadh), the hereditary rulers of the state of Oudh of which Lucknow was their capital. There were various versions of the Nawabs’ emblem, most probably modified as each new Nawab took the throne. 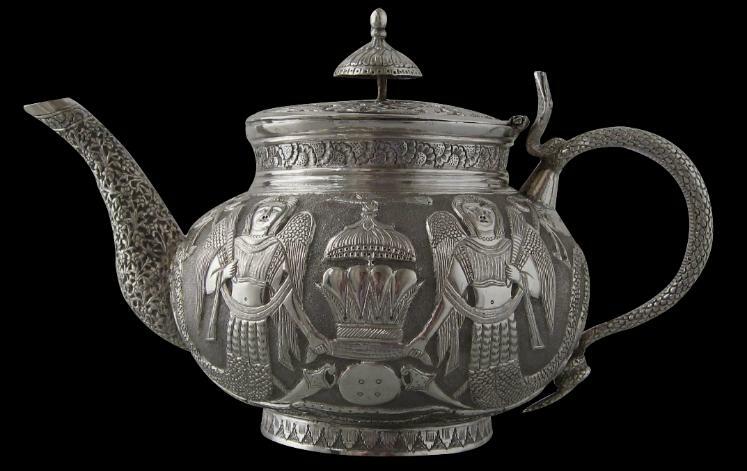 The emblem closest to the one employed on the tea pot was also one that was used on the Jal Pari (the Mermaid Gateway), which was one of the entrances to the Nawabs’ Qaisarbargh Palace complex. The gates were demolished around 1870. 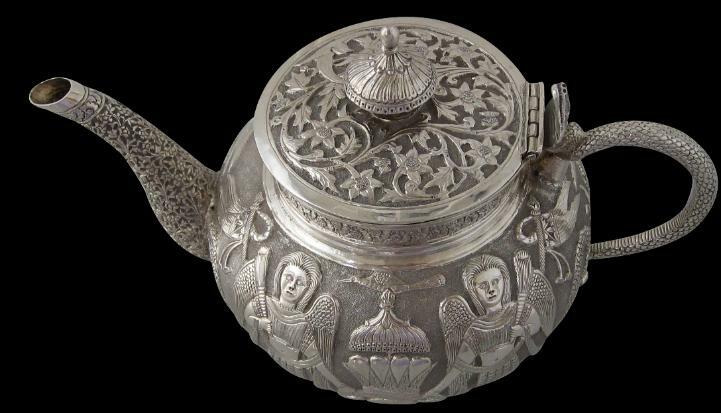 The emblem is used on both sides of the tea pot and comprises two winged mermaids (or probably more accurately mermen), holding ceremonial whisks and supporting royal standards. Between them, over a shield and two swords, is the royal crown of Oudh over which is the Oudh umbrella on which sits a bird. The form of this bird is used as an architectural element on Oudh public buildings in Lucknow to crest domes and finials. The chasing on the spout represents the coriander plant in flower. The hinged lid is embellished with a scrolling flowering vine pattern, the finial being in the form of the royal umbrella used by the ruling house and which also is echoed on architectural elements on the public buildings in Lucknow erected by the Nawabs. The handle is in the form of a cobra. The tea pot sits on a low, engraved ring foot. By the mid-nineteenth century, the Nawabs had lost their political and military usefulness to the British, and so the British annexed the kingdom outright in 1856. The then Nawab Wajid ‘Ali Shah was exiled to Calcutta with most of his family. And so this tea pot provides an elegant reminder of the Nawabs and their rule. 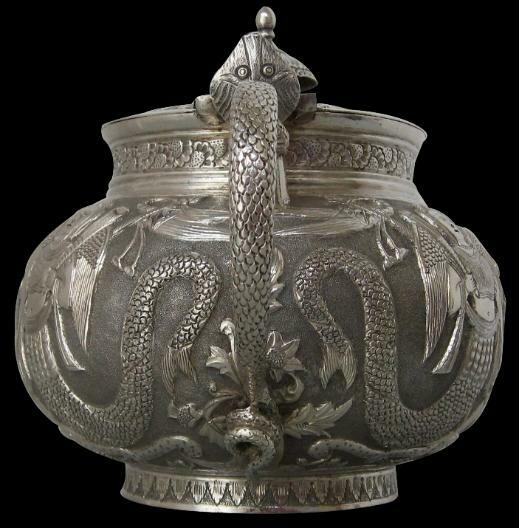 A silver over-laid hookah base in the Lucknow State Museum and illustrated in Trivedi (1989, p. 117) also depicts a version of the mermaid emblem of the Oudh royal house and comments that the base might have been used in the palace, hence the emblem. 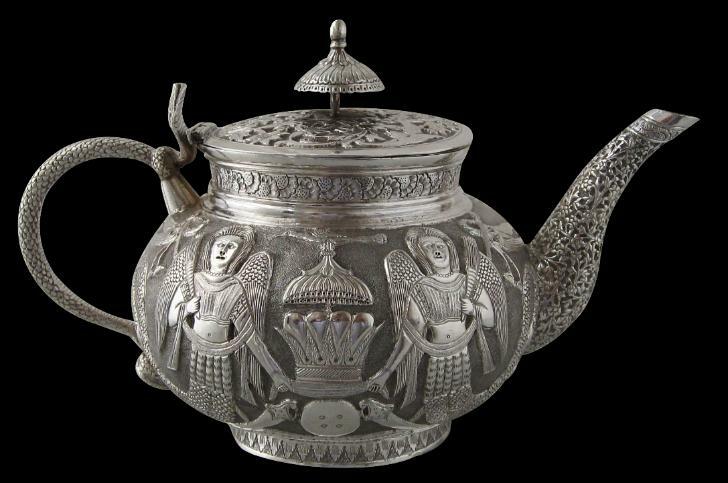 Similarly, it is quite possible that this tea pot was also produced for the royal house. Llewellyn-Jones, R. (ed. ), Lucknow: City of Illusion (The Alkazi Collection of Photography), Prestel, 2006; Trivedi, S.D., Masterpieces in the State Museum, Lucknow, 1989; and Markel, S. et al, India’s Fabled City: The Art of Courtly Lucknow, LACMA/DelMonico Books, 2010.